Other Steward ERs are not exactly "full-service" either and time has been wasted with patients triaged and charged hefty and profitable ER fees and then shipped to a "real" hospital" with full service for the care they need. Paramedics are already wise to this (as well as those voting with their feet) and go elsewhere. There must be some licensing requirements regarding what constitutes a full service emergency room so that patients can make an informed decision regarding where they should go for emergency care. Most patients who go to an ER assume that even if there is not some basic specialty care available, that there is someone on call. I have discovered when vacationing on the Cape that this ring less this not always the case. More than Steward are offering mediocre care. Ambulance drivers? Or highly skilled Paramedics and EMT's. When underutilized rural hospitals close but a stand-alone ER is left behind, it’s a lot better than nothing if the next closest hospital is 50 miles away or more. In this case, with two full service hospitals nearby, it doesn’t sound like there is much, if any, need for the Quincy ER. I read recently that 20% of the country’s hospitals beds closed since 1992 bringing the total down to 800,000 or so beds from about one million and we still have too much capacity in many places, especially the larger cities. As more care can be safely done on an outpatient basis or in a stand-alone surgical center, less invasive surgical techniques significantly shorten recovery times and better drugs and medical management reduce the need for hospitalization in the first place, the faster we reduce unneeded hospital capacity, the better. Hospitals are where the biggest bills are generated and without price and quality transparency to boot. If they want to maximize their chance of staying in business, they might try providing good quality care and fair and transparent prices. To the second Anonymous----Yes, highly trained EMTs and Paramedics employed by fire departments and not just ambulance drivers. To Barry----Agreed, the bigger issue with Quincy and Steward's agreement with the AG is more complicated. 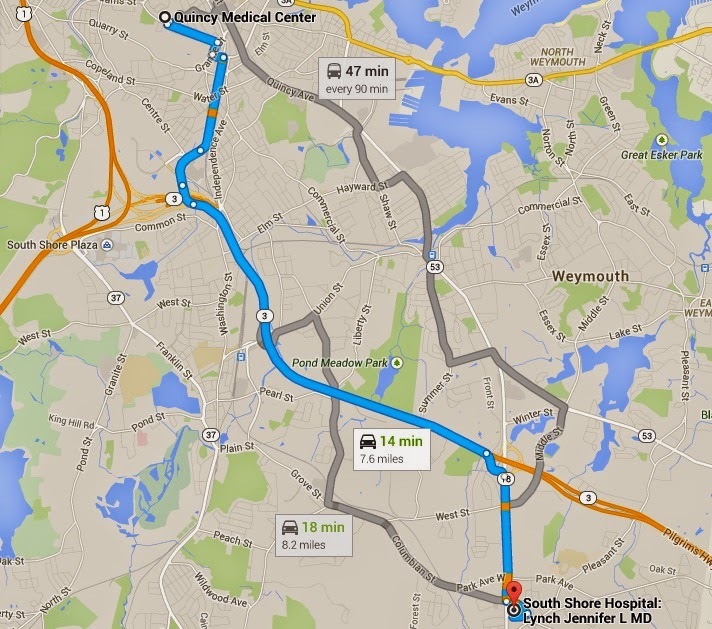 There may well be no need for any sort of ER in Quincy considering the many other full service hospitals nearby. Certainly there is no reason to encourage a mediocre one or to allow Steward to pick off the profit centers they want to retain (the Cardiac cath business they want to transfer from Quincy to St Ann's which is almost on top of Southcoast) and to dump the losers. I understand that you do not come from a healthcare or medical background, but in business trends are taken into consideration. When Steward was permitted to buy out the hospital group only three years ago and all but a couple were awash in red ink; the world knew that hospitals generated the biggest costs in healthcare and that inpatient stays were plummeting as you pointed out. The AG of our state extracted promises from Steward regarding how they would do business in exchange for consent to become for-profit. Possibly for reasons beyond just healthcare costs and now Steward is reneging. I do agree that measurable outcomes(by genuine metrics not patient satisfaction forms poorly sampled) and transparent costs are still not available. If I have a cold, I am happy to go to an ER or urgent care, however, if I have a serious injury; I do not want to waste time in triage and while transport is arranged at a community hospital not equipped to treat me to begin to receive the emergency care I need. I would prefer a quick ride by the experienced EMTs to the nearest full service hospital. A satellite ED does not make sense to me unless they plan to have on-site or in-unit ICU capacity and such. Even at some urgent care sites some patients are sicker than they know and have to be transfered ... some even via a 911 call. So I am not sure a satellite ED is a victory at all. Steward is starting to show their true colors. They are being fined $1,000 per week by the state of Massachusetts due to not releasing their 2013 consolidated financial statements. They walked out of the Quincy agreement years before they were allowed to and didn't even give the proper notice that they were supposed to give to the state. Then they try and slip their cath lab license down to St. Anne's while the head of HHS Polanowicz making this transfer decision is a former employee who may rejoin the system in the future. They're are ignoring any rules they agreed to while bending other rules like the location and distances between cath labs in the state. This is what you get when you let a private equity firm like Cerberus into your state to run a hospital network. Things will continue to deteriorate at Steward and these guys don't care one bit other than stripping of the assets and loading it up with debt before they walk away. They started with some horribly put together PR and lots of promises---anyone remember the raised fist log captioned Quality to the People which looked like it was plagiarized from Communist Russia? It scared all the old folks and made hospital staffs cringe in embarrassment. That is now long gone along with much hope for much follow through on all the promises they made. While laying off staff and reducing services, they continue to pay inflated salaries to the execs and fleet of lawyers. If they were not hiding something, they would open the books.